Flewellen presenting on Community Archaeology and Capacity Building at the 2017 annual American Anthropologists Association conference. Photo taken by Dr. Justin Dunnavant. As a scholar of anthropology and African and African diaspora studies, Flewellen's intellectual genealogy is shaped by critical theory rooted in Black feminist epistemology and pedagogy. This epistemological backdrop not only constructs the way she designs, conducts and produces her scholarship but acts as foundational to how she advocates for greater diversity within the field of archaeology and within the broader scope of academia. What this has looked like in practice is Flewellen aiding in the founding of the Society of Black Archaeologists, creating a community-engaged sustainable research project, and directing an award-winning archaeology field school dedicated to training underrepresented students in archaeology and heritage studies. Dr. Flewellen with Estate Little Princess Field School participant during the 2017 field season. Photo taken by Dr. Alicia Odewale. The theoretical framework that guides Flewellen's research is Kimberlé Crenshaw’s (1991) theorization of intersectionality, which locates the positionality of Black women at the intersections of race, gender and class operations of power and oppression. Intersectionality is the crux of Black feminist theory. Black feminist theory within archaeological research is fairly new – only a little over a decade old (Franklin 2001; Battle-Baptiste 2011). Although intersectionality has not made substantial inroads within the field of historical archaeology, where it is seen most clearly is in Black feminist archaeological scholarship. A small group of archaeologists, primarily Black women, began asking how the application of Black feminist thought could aid in the interpretation of African American past lived experiences in ways that did not compartmentalize multiple facets of Black women’s experiences but rather interpreted them as wholly complex (Franklin 2001; Battle-Baptist 2011; Agbe-Davies 2001, 2007; see also Wilkie 2003, 2004). Through Flewellen's implementation of a Black feminist framework, her scholarship ask how race, gender, and class shaped sartorial practices of self-making among members of the African Diaspora from enslavement through emancipation. Flewellen is currently developing a multi-year sustainable archaeology project in St. Croix, USVI in collaboration with The Slave Wrecks Project (SWP) - a global change program comprised of an international network of institutions and individual associates that investigate the global history and enduring legacies of the African Slave Trade, administered by George Washington University and the Smithsonian Museum of African American History and Culture – as well as the University of the Virgin Islands (UVI), and Diving with a Purpose (DWP), an underwater archaeology advocacy group. The project has two intended functions: 1.) the development of a long-term research agenda that employs a landscape approach – inclusive of both maritime and terrestrial landscapes – to the study of slavery and emancipation in St. Croix, and 2.) the training of UVI and Crucian youth in scuba diving as well as maritime and terrestrial archaeological methodologies.The project - centered on the Atlantic slave trade - involves simultaneous maritime, terrestrial, and oral historical research projects as well as training in scuba diving and archaeological methods. As the Principal Investigator of the terrestrial archaeology component of the project, Flewellen explores Afro-Crucian identity formations from slavery into emancipation (1738-1960s) by analyzing the built and natural environment, gendered placemaking, and memory, as well as conducting a multiscale social analysis of household, community, and society. The “Kitchen House” at the National Park Service Site Kingsley Plantation. Photo taken by Dr. David Markus. SBA Members at SHA 2017 in Dallas, Texas. 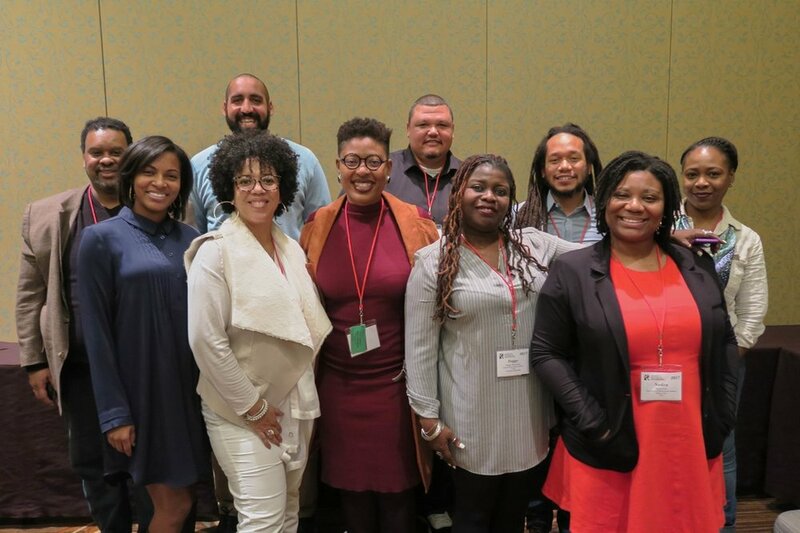 (from left) Row 1: Dr. Alexandra Jones, Dr. Whitney Battle-Baptiste, Dr. Ayana Flewellen, Dr. Peggy Brunch, Dr. Nedra Lee, Row 3: Dr. Lewis Jones, Dr. William White, Dr. Jerry Howard, Dr. Justin Dunnavant, and Khadene Harris. Dr. Flewellen is also the co-founder of Society of Black Archaeologists (SBA). Launched in 2011, the SBA was established to create a strong network of archaeologists that will advocate to ensure the proper treatment of African and African diaspora material culture, promote more people of African descent to enter the field of archaeology, ensure community collaborations, raise and address concerns related to African peoples worldwide, and highlight the past and present achievements and contributions people of African descent have made to the field of archaeology.